On her family's South Georgia olive plantation, Eva Knox is on the hook for murder in the third delightful Olive Grove Mystery from the author of One Foot in the Grove and Cold Pressed Murder. On a sizzling-hot September day, Eva Knox's ex-boyfriend, Dudley Dexter Codman the Third, along with a bunch of his corporate cronies from Boston, arrive at Eva's family's guest inn and olive farm, Knox Plantation. Maps and binoculars in hand, the New Englanders claim they're on a bird-watching holiday. Only, Eva knows that her ex doesn't know the first thing about birds. Nor does he care. Eva can't fathom why he'd show up after all these years in her off-the-beaten-path hometown--nearly 1,200 miles from Boston. When Dudley's body is found drowned in the pond, Eva starts fishing for answers. But she doesn't have much time after authorities determine that her ex was poisoned by one of Eva's family's olive oils. She'll have to find the real killer before her family is caught for murder. Dipped to Death by Kelly Lane is the third An Olive Grove Mystery. Eva Knox works as the head of public and guest relations for her family’s inn and olive farm known as Knox Plantation in Abundance, Georgia. Eva was surprised the previous day when one of her ex-fiancés, Dudley Dexter “Dex” Codman III arrived at the inn with colleagues from Perennial Paper. She is surprised and suspicious of his presence in her hometown especially when they claim they are going to be birdwatching (Dex is not a birdwatcher or nature lover). After finishing the housekeeping chores, Eva with her dog, Dolly heads for a relaxing afternoon at the lake. She spots something in the tall weeds and checks it out. Eva finds Dex naked and dead. Since Eva had a very loud and public argument with Dex the previous evening, she is a prime suspect in his death. Eva starts digging to find out what Dex and his cohorts have been up to while in town. She needs to work quickly because the evidence is stacking up against her. Someone is not happy with her snooping and attempts to scare Eva away. What was Dex up to that got him killed? Dipped to Death may be the third book in the series, but it can be read alone. This book is for readers who enjoy light, humorous cozy mysteries. Eva is one of those female main characters who bumbles and stumbles her way through the book. Eva does all the work while her sister, Daphne sits around giving orders and playing the genteel Southern hostess (with her pearls and exaggerated Southern accent). She is doing the housekeeping chores because the girls Daphne hired are daughters of friends and they rarely show up for work (of course). Personally, I would tell Daphne where she could stuff it, but Eva just takes what her sisters dishes out. Readers get to enjoy all of Eva’s rambling thoughts along with everything she eats and drinks. Dolly, Eva’s dog, was a delightful addition to the story. There are two love interests for Eva (a love triangle). Buck Tanner, the local sheriff and her first ex-fiancé, who calls her “baby doll” (I began to wonder if he knew her real name) all the time. Ian Collier owns the estate next door and is hiding a secret. Eva spends a great deal of time ogling the two men and acting like a twit in their presence. The author has a descriptive writing style (every little detail is described) that allows readers to visualize the scenes and includes Southern colloquialisms. I did tire of the repetition (I got it the first time) and felt the book was too long (366 pages). I did like the information on the benefits of olive leaf extract. It was informative and interesting. The murder occurs early in the book (it was obvious who would be killed). There are some good clues that will aid readers in identifying the person who committed the dastardly deed. 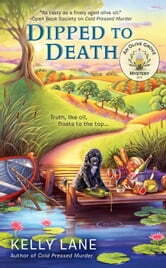 Dipped to Death does contain foul language, copious amounts of alcohol and what I term “raunchy” talk which is very unusual for a cozy mystery. I am giving Dipped to Death is 3 stars.